An absolutely impeccable piece. Truly, this is one of the nicest items of clothing I have ever owned. The detail and quality is top-notch, and was tailored excellently, it fits like a glove and is incredibly comfortable. The time it took to create the suit was well worth the wait, and arrived on my doorstep the day after it was shipped. 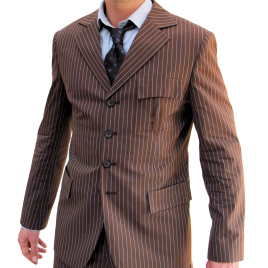 I cannot wait to wear this as often as I can, the Tenth Doctor is without a doubt my favourite incarnation, and Magnoli Clothiers have definitely done his suit justice with their spot-on handy work! I will certainly be buying from Magnoli again in the near future! If you have any doubt about purchasing this item, do not hesitate - as long as you get your measurements right, you won't regret it. Wonderful suit!